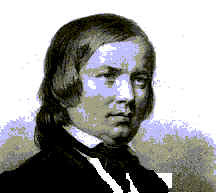 Schumann, Robert Alexander (1810-1856), German composer, a principal figure of the early Romantic movement in 19th-century music. Schumann was born on June 8, 1810, in Zwickau, Saxony, and educated at the universities of Leipzig and Heidelberg. The son of a bookseller, he early became absorbed in literature, particularly that of the German Romantic writers E.T.A.Hoffmann and Johann Paul Richter. In 1830 he abandoned the study of law in order to devote himself to music. He studied piano with the German teacher Friedrich Wieck, but a permanent injury to one of his fingers forced him to abandon the career of pianist. He then turned to composition and the writing of musical essays. In 1834, in an attempt to fight what he saw as the artistic philistinism of the time, he founded the music journal Neue Zeitschrift f�r Musik, which he edited until 1844. Schumann married the pianist Clara Josephine Wieck, the daughter of his former teacher, in 1840. As Clara Schumann she became a major exponent of his piano works. In 1843 Schumann was appointed to the faculty of the newly founded Leipzig Conservatory, but finding himself temperamentally unsuited to teaching, he soon resigned. In 1850 he was appointed town music director of D�sseldorf; advancing mental illness, which had threatened him since adolescence, forced him to resign in 1854. That same year Schumann attempted suicide and was confined to an asylum near Bonn, where he died on July 29, 1856. One of the most archetypal of Romantic composers, Schumann characterised himself in two imaginary figures, the forceful Florestan and the poetic Eusebius, whose names he signed to his critical articles and whose musical portraits he drew in his piano suite Carnaval (1834-1835). During 1840, following his marriage after years of opposition from Clara's father, he achieved what is generally considered his greatest work when he suddenly turned to writing songs. In that year he composed 138 songs of the finest quality, among them the great song cycles Liederkreis (two cycles, texts by Heinrich Heine and Joseph Eichendorff), Myrthen (texts by various poets), Frauenliebe und Leben (Woman's Love and Life, text by Adelbert von Chamisso), and Dichterliebe (Poet's Love, text by Heinrich Heine). Schumann concentrated on the psychological subtleties of a poem and in his songs gave to the piano accompaniment an equal role in expressing the mood and meaning of a poem, often in extensive epilogues at the end of each song. Schumann's piano works are largely musical expressions of literary themes and moods. With the exception of the Fantasy in C Major (1836) and ?tudes Symphoniques (1854), his finest piano compositions consist of cycles of short pieces in which a single lyrical idea is brought to completion within a small framework. In addition to Carnaval, these include Papillons (Butterflies, 1829-1831), Kinderscenen (Scenes from Childhood, 1838), Kreisleriana (1838), and Album f�r die Jugend (Album for the Young, 1848). Although Schumann rarely achieved in his larger works the unity of form found in his songs and piano pieces, they do contain much that is beautiful and dramatic. This is particularly true of the First Symphony (1841), Piano Quintet (1842), Piano Concerto (1845), Second Symphony (1846), and Piano Trio (1847). The Fourth Symphony has an innovative form in which the four movements are linked and play continuously. Among his other compositions are a choral work, Das Paradies und die Peri (Paradise and the Peri, 1843), and an unsuccessful opera, Genoveva (1847-1848).